You can find all my Christmas lesson plans HERE in case you are teaching songs other than what I'm doing this year. Or you can also go to the "Song Index" tab above and search for any songs you are teaching - I may have a lesson plan for it if it's from the Children's Songbook. This is my second go-around teaching Picture a Christmas. You can find my original lesson plan HERE where the kids (or I for Jr. primary) draw the nativity items on the board with colored chalk. To teach the song this year, I created a digital nativity set because, sadly, I don't own one! That said, if you own an actual nativity set, please, go ahead and use it for this song. Since this song is so visual, it would be fun to create a live nativity as well! You can download the stable HERE. It prints on 4 pages so it will be large enough to fit the rest of the pieces. 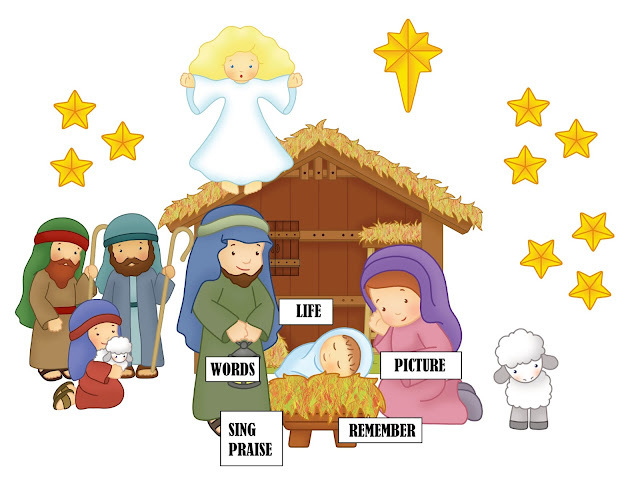 Then the rest of the nativity images can be downloaded HERE. Why should we think of Jesus' life and why are his words so dear? Why do we sing praise to Him? Why should we remember Him? Have the kids begin to sing the chorus with you. Repeat until they know it well. Then remove everything from the board. Begin to build the nativity following each song phrase (stable, 3 small star clusters, angel, large star, baby Jesus, Joseph, Mary, shepherds & sheep). Sing the phrase to the kids, add the image to the board, then have the kids sing the phrase with you. Repeat until all images are on the board, creating a full nativity scene and the song has been sung several times through. Time permitting, tell the kids to take a "picture" of the nativity scene and start removing items, repeating singing the song through each time an item is removed. Repeat until the pictures are removed and the song has been sung several times. This could also be done as a follow-up lesson for review!! Play "what's missing?" by secretly removing an item and as you sing the song, the kids can figure out what's missing. Put it back, then repeat until each item has had an opportunity to be removed and the song reviewed several times! This is so wonderful! Thank you! I love the nativity images.